But perhaps the most important reaction—apart from his family—is Steve Wozniak's. According to the LA Times, he was "overwhelmed and could not get in touch with his emotions". His only words: "People sometimes have goals in life. Steve Jobs exceeded every goal he ever set for himself." Steve Jobs was my friend and hero for over thirty years. The Apple II changed my life before I met him, and working closely with him to create the original Macintosh was the high point of my career, if not my entire life. Steve was more than the greatest business person of his generation, he was a passionate artist who poured his soul into his work. I will miss him terribly, even though he will live on in Apple products for many years to come. I am extremely saddened learning of Steve's death. It was a tremendous experience and personal honor to have worked with Steve on the original Macintosh. His passion and commitment to make the world a better place through Apple technology had a great influence on my own life. Steve was a force of nature, and we will all miss him. Working in the halo, no, giant aura, of Steve was unimaginably motivating. But Steve had a sizable streak of humility. Yes, he was the very definition of charisma. Yes, he exuded confidence. And yes, he built the world's leading animation studio and the world's greatest company. But he never denied the extent to which serendipity and other people's work played a part in his success. And he never let himself feel invulnerable. 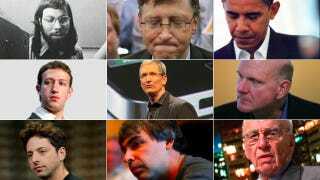 Silicon Valley owes its culture to many people, but Steve tops the list. I miss him. May Steve rest in peace. My deepest sympathy to his loved ones. No CEO has done more for his customers, employees, and shareholders than Steve. He changed the world—my world, your world, the entire world. His words to live by: "There must be a better way." You changed our lives, Steve, and you showed us that there is a better way...we will miss you. Steve was one of a kind, and will truly be missed. Steve Jobs was an extraordinary visionary, our very dear friend and the guiding light of the Pixar family. He saw the potential of what Pixar could be before the rest of us, and beyond what anyone ever imagined. Steve took a chance on us and believed in our crazy dream of making computer animated films; the one thing he always said was to simply ‘make it great.' He is why Pixar turned out the way we did and his strength, integrity and love of life has made us all better people. He will forever be a part of Pixar's DNA. Our hearts go out to his wife Laurene and their children during this incredibly difficult time. My condolences to Steve Jobs' family and friends. We've lost a unique tech pioneer and auteur who knew how to make amazingly great products. Steve fought a long battle against tough odds in a very brave way. He kept doing amazing things in the face of all that adversity. As someone who has had his own medical challenges, I couldn't help but be encouraged by how he persevered. Today is very sad for all of us. Steve defined a generation of style and technology that's unlikely to be matched again. Steve was so charismatically brilliant that he inspired people to do the impossible, and he will be remembered as the greatest computer innovator in history. Steve Jobs was a great friend as well as a trusted advisor. His legacy will extend far beyond the products he created or the businesses he built. It will be the millions of people he inspired, the lives he changed and the culture he defined. Steve was such an 'original,' with a thoroughly creative, imaginative mind that defined an era. Despite all he accomplished, it feels like he was just getting started. With his passing the world has lost a rare original, Disney has lost a member of our family, and I have lost a great friend. Today, we lost one of the most influential thinkers, creators and entrepreneurs of all time. Steve Jobs was simply the greatest CEO of his generation. While I am deeply saddened by his passing, I'm reminded of the stunning impact he had in revolutionizing the way people consume media and entertainment. My heart goes out to his family and to everyone who had the opportunity to work beside him in bringing his many visions to life. Today the world lost a visionary leader, the technology industry lost an iconic legend and I lost a friend and fellow founder. The legacy of Steve Jobs will be remembered for generations to come." People like Steve Jobs change our world. My sincere condolences to his loved ones and to everyone who admired his intellect and talent. Woke to the news of Steve Jobs's death. He changed the world. I knew him a little and admired him entirely. Love to Apple and his family.